We love it when our clients refer us. We want to give back to our clients when they refer us. That’s why we’ve set up a brand new “Share the Love” referral program! Simply refer a new client to Revival Photography, and when they book their session, $25 will be credited under your name for your next portrait/child session! (Don’t forget to tell them to say “you sent them”!) There’s no limit! 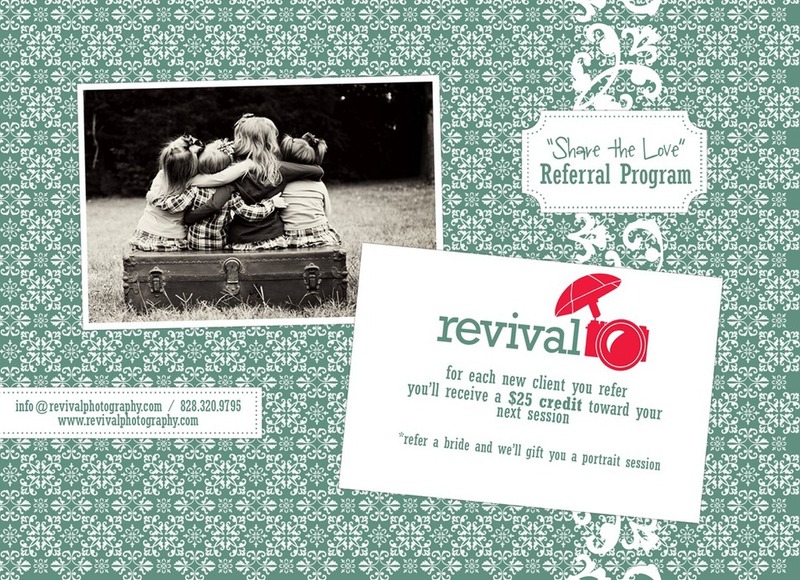 Refer 10 people, and if they book with us, then you’ll get 10 – $25 credits toward your session! It’s simple. Want to earn a session ASAP? Refer a bride or groom to Revival Photography and we’ll “gift” you a portrait/child session when they book their wedding with us! So get ready…get set…GO and share us with your friends! Thanks guys! The BIGGEST compliment you can give us is the referral of your family and friends.